Infiniti, the luxury brand of Nissan, can be available for the first time in 1989 in North America. The models on sale also include high performance luxury Infiniti Q45 and luxury coupe Infiniti M30, etc. Elliptic curve represents the unlimited expansion in the world. Two straight lines are the representative of the top road. Infiniti wheel rim is equipped with the double arms. There is multi-link fork suspended at the rear of it, which can increase the stability and improve the accuracy of the control. In addition, this Infiniti wheel rim is made of steel. So the weight can be reduced 30% than other materials. Lighter weight is helpful to reduce the friction between the tires and the earth surface. So this Infiniti wheel can improve the speed of the car. Wuxi Hengsheng Wheel Co., Ltd is a professional Infiniti wheel rim manufacturer and supplier in China. In addition to Infiniti wheel rim, we also provide other famous models steel wheels (rims) for our clients around the world, like FIAT style wheels (rims), Ford wheel (rim for Mercury), Geely wheel (rim), Honda wheel (rim), Hummer wheels (rims), HYUNDAI wheel (rim), etc. 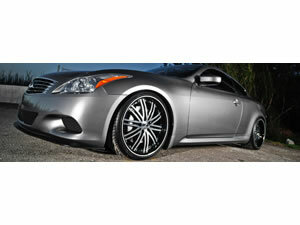 We possess a professional technology team to guarantee the manufacturing of Infiniti wheel rim. We will checkout all the products and give out a survey report. According to the needs of every client, there will be a dynamic balance sample survey among parts of the qualified Infiniti wheel rim.